In one of those bizarre twists of logic, cytotoxic T lymphocytes were so named because they’re T lymphocytes that are cytotoxic. Is that all they are? 51Cr release assays2 are a traditional way of measuring cell death, and you can set them up in 96-well plates and get moderate throughput to test multiple conditions. It’s a convenient system, and it was the first one to be widely used to T cells. Doherty and Zinkernagel used it in their Nobel-Prize winning work on MHC restriction, for example. However, as you’d expect, systems which are designed for operator convenience don’t necessarily reflect reality. Measuring cell death in vivo, that is, inside a virus-infected animal, is much more complicated than in a 96-well plate. Do CTL actually kill in that context? And even if it does happen, is it the only thing that happens? Could CTL be doing something else during an infection, other than killing, that helps in their mission? You might wonder if immunologists were blinkered by the name — how could cytotoxic T lymphocytes not be, first and foremost, cytotoxic? — but I don’t think it’s revisionist to say that’s not true. I think most of us were pretty sure that CTL had lots of other weapons in their arsenal, but how much other stuff? How often were CTL actually cytotoxic, and how often did they do other stuff? One problem with cytotoxicity as an assay for this question, is that it’s a bulk assay. Until recently you couldn’t really measure killing by a single CTL. (You can now, though. Uli von Andrian has some beautiful videos of CTL punching holes in their targets here here, from his 1996 2006 Immunity paper. 3 Von Andrian’s site is filled with beautiful and amazing videos; check them out.). You mix together a batch of CTL with the targets — the targets die, well and good — but were all of the specific CTL helping out, or was it just the work of a minority of them that are specialized for killing? In 1996, Mark Davis introduced a new and exciting technology, MHC tetramers, that’s able to rapidly identify T cells by phenotype rather than function. 4 That is, if a T cell has the right T cell receptor to recognize a virus-infected cell, tetramers can show you the T cell — even if it cannot kill. 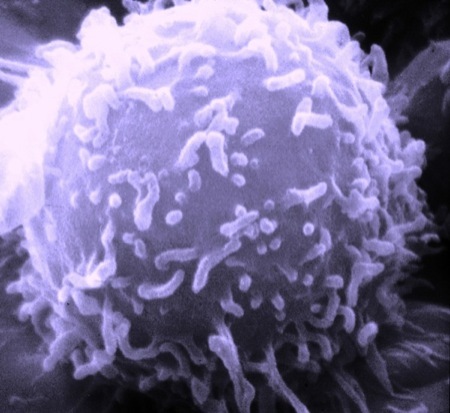 This was pretty revolutionary, and led to some drastic increases in estimates of T cell number — previous methods of counting specific T cells were known to be underestimates, and tetramer staining showed us that there were sometimes 100 or 1000 times more CTL floating around than had been esimated. It didn’t really answer the cytotoxicity question, though. Tetramer staining correlates well with cytotoxicity levels, but you’d see that even if 1% of the CTL were actually cytotoxic, and the rest were doing something else. Another new technique that came out around the same time or a little later5 is intracellular cytokine staining. This identifies T cells that not only recognize their target, but react to it by producing cytokines, such as interferon. In other words, intracellular cytokine staining not only lets you measure T cells, it offers a measure of functionality other than cytotoxicity. Correlating this with tetramer staining was a little more informative; most tetramer-positive cells were also able to produce interferon, for example. So what’s the interferon there for? Interferon isn’t directly involved in cytotoxicity, and experiments from around that time showed that CTL can do a lot of antiviral work just using interferon, without getting all cytotoxic on us. I was originally going to talk about that experiment — Frank Chisari’s hepatitis B mouse model — here, but this is all background, so I’ll get to that some other day. Yes, 2.5 does seem to fix that, although switching between ‘Visual’ and ‘HTML’ might still break it – I haven’t done that particular experiment (I use WP at my personal weblog).